Media captionThe prosecution famously asked: "Is it a book you would wish your wife or your servants to read?" "Is it a book that you would... wish your wife or your servants to read?" 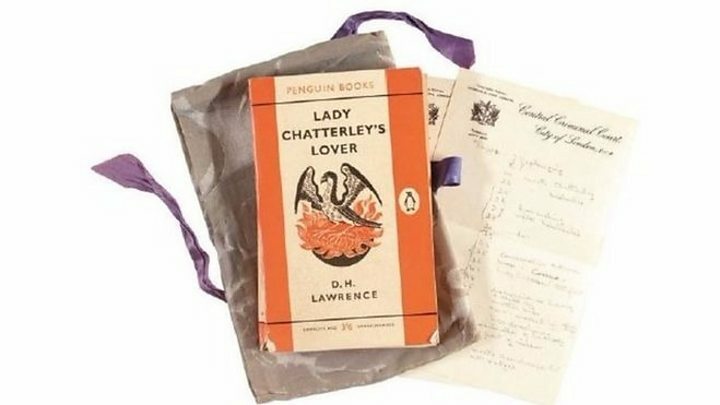 A copy of Lady Chatterley's Lover, used by the judge who presided over the famous obscenity trial in 1960, is to be sold at auction next month. The paperback was kept in a damask bag, hand-stitched by the judge's wife, for discretion as it was carried into court each day. It's expected to fetch up to £15,000 when it comes under the hammer. The trial caused a sensation when Penguin Books were found not guilty and it led to a new era of liberalisation. It was one of the most notorious trials in British literary history. In 1960, Nottinghamshire author DH Lawrence's novel about a passionate affair between an aristocrat and her husband's gamekeeper, saw the publishing house Penguin Books tried for obscenity. The judge's copy of the novel was at the centre of proceedings, and Sir Lawrence Byrne brought it into court every day concealed in a blue-grey damask bag, hand-stitched by his wife, to keep it out of the sight of prying press photographers. Before the trial, Lady Dorothy Byrne had read the book and marked up the sexually explicit passages for her husband. She compiled a list of significant passages on the headed stationery of the Central Criminal Court, noting the page number, and adding her own comments, such as "love making", "coarse", and so on. Sotheby's describes it as perhaps the most important copy of the novel to have survived, and it is this that comes up for auction on 30 October. The 1960 trial itself turned into a spectacular piece of legal theatre, with the prosecution getting a laugh from the courtroom for famously asking: "Would you approve of your young sons, young daughters - because girls can read as well as boys - reading this book? Thirty-five leading literary and academic figures were called by the defence to the stand. The jury took just three hours to find the publishers Penguin not guilty. The case, which was seen as a test for the 1959 Obscene Publications Act, came to encapsulate the clash between the old establishment and the new wave of liberalisation in the 1960s. It was a great victory for Penguin, which sold out of its print run of 200,000 copies in a day.